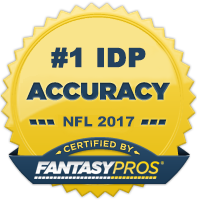 Week 1 saw a litany of IDP injuries, the most notable being perennial IDP stud Derrick Johnson going down for the year with a torn Achilles. This is a big blow for the Kansas City Chiefs and fantasy owners alike as Kansas City is paper thin depth-wise at the linebacker position. 2012 2nd round selection Zach Brown is likely out for the season after suffering a torn pectoral muscle. Zaviar Gooden will take his spot and has a chance has snagging an every down role next to Wesley Woodyard. I'll be tracking his progress during practice this week, so stay tuned for further updates in the Every Down Linebacker thread. An already uncertain Miami linebacking group got even more suspect as starting WLB Dannell Ellerbe was placed on IR Monday with a hip injury. Additionally, MLB Koa Misi appeared to suffer a high ankle sprain, which would put him out 4-6 weeks. This potentially leaves the Dolphins without any of their typical starting linebackers as Phillip Wheeler missed last week due to a thumb injury. Suffice to say, this situation is a complete mess. In the short-term, Jelani Jenkins figures to be the main every down candidate and have better than expected value, at least while Misi is out. We should hopefully have more information on this situation come mid-week. #1 overall draft pick Jadaveon Clowney has a torn lateral meniscus and could miss 4-6 weeks. Whitney Mercilus will assume the starting OLB position until Clowney returns, but isn't worth a roster spot in most fantasy leagues. Jonathan "The Crypt Keeper" Cyprien left Sunday's game early with a concussion and did not return. He will have to pass the league mandated concussion test before getting back on to the field. His injury status is something fantasy owners should pay attention to closely as Cyprien was primed to launch himself into DB1 status this year. Vontaze Burfict was another concussion victim in Week 1. He managed to rack up 4 solo tackles, a FF, and a FR before exiting the game in the 2nd quarter. IDP darling Vincent Rey will take the snaps on the weak side should Burfict miss anytime. Fantasy DL2/DL3 Chris Long rolled his ankle in the third quarter of Sunday's game and did not return. Eugene Sims/Williams Hayes could be worth a spot start against Tampa Bay if Long is unable to suit up. Bills Safety Aaron Williams suffered a possible concussion in the opening week. Buffalo is calling it a "head injury" as of right now, but that could change as more details emerge. Duke Williams would be his replacement if he missed anytime and could possess some decent fantasy value in deeper leagues. In somewhat of a surprise, Christian Kirksey played in a majority of the snaps over Craig Robertson. If he can continue to increase his playing time, he's worth keeping an eye on. Despite playing every down, Brad Jones had a disappointing game in the NFL season opener against the Seahawks. He still appeared to be a bit hampered by his quad injury. It's not time to give up on him yet (especially with a very nice matchup against the Jets next week), but proceed with caution. Brian Cushing did not play every down as the team was easing him back into a full-time role. This hurt his box score numbers. I still really like his upside, but owners may want to think about other options next week depending on what the coaching staff says about his expected playing time for Week 2. Despite playing every down in the preseason, Brandon Spikes found himself on the sidelines for a good portion of the Bills' sub-package snaps against the Bears. If this continues to be the trend moving forward, it's a killer to his value. Mark this one as a situation to monitor. In a bit of a twist, Michael Wilhoite played every down next to Patrick Willis. Many thought Chris Borland would see some rotation snaps in the game at the expense of Wilhoite, but that never happened. DT Gerald McCoy (TB) - McCoy was a player I was very high on coming into the season. In my draft guide, I called him out as having a very good chance at finishing the year as fantasy's #1 defensive tackle. Well, he got off to a good start against the Panthers putting up 8 solos and a sack. He's a must grab in DT-required leagues if he's somehow still out there. DE Willie Young (CHI) - Young was on my preseason watch list and he started the season off on a good foot with 3 tackles (2 for a loss), 1 assist, and 1 sack. Although not a dominant performance, he's important to take note of it as he could provide a steady level of contribution for owners as a DL3 in 12-14 team leagues. DE Cameron Heyward (PIT) - Heyward didn't get much love this draft season despite being a top 10 fantasy lineman the 2nd half of last year. Playing in Pittsburgh on a defense that hasn't traditionally churned out solid fantasy linemen has probably turned people off to him, but that is a mistake. Heyward has the skill set to be a solid, high floor DL3/DL2. DT Sen’Derrick Marks (JAX) - Similar to Young, Marks was a player I thought could have sneaky value heading into the season. A 4-1-1 (2 TFLs) is a good start and enough for me to trust he'll be a worthwhile DT2 add in a majority of leagues. DE Wallace Gilberry (CIN) - Gilberry found his way onto many a sleeper list this preseason as his per snap production last year forecasted a potential breakout season in 2014. To put things in perspective, he averaged the same amount of PPS as Chandler Jones. Admittedly expecting that same level of production is a stretch, but a 35-20-10 stat line is definitely within reach. WLB Sio Moore (OAK) - Moore carried over his fantastic preseason play into Week 1 of the regular season against the Jets where he posted the gaudy stat line of 11-2-1. Granted, Oakland's defense was on the field a ton and there were several players with above average tackle numbers, but I expect that to be the norm rather than the exception. Now is the time to grab Moore, who could be this year's Von Miller. WLB Jamie Collins (NE) - Collins was a player that continually moved up my draft board as the preseason progressed. I was a bit concerned that there wouldn't be enough tackles to go around to feed both him and Jerod Mayo, but I came out of Sunday's game against Miami feeling confident that shouldn't be the case. Mayo is still the player to own of the two, but don't slouch on Collins as he could put up LB2+ numbers moving forward. MLB Josh Mauga (KC) - Mauga, an undrafted free agent out of Nevada, won the starting linebacker spot next to Derrick Johnson in Week 1 after largely being a special teams player throughout his career. Now with Johnson on IR and Joe Mays not slated to return to Week 10, Mauga will likely be the every down linebacker in KC by default. He had 8 solos last week and I wouldn't be surprised to similar type of production continue. He's worth a pickup as your LB3. Just don't expect more than 10 or so assists out of him as the Chiefs stat keeper is the very stingy in regards to handing them out. MLB Rolando McClain (DAL) - McClain still has to work on conditioning and remains an overrated on-the field player. However, the Cowboys defense was as bad as advertised to begin the season and he should see a ton of tackle opportunity if he can stay on the field. Teammate Justin Durant is also worth a look in deeper leagues as a LB3/LB4. WLB Brandon Marshall (DEN) - Marshall, not Nate Irving as many anticipated, was the lone every down ILB for the Broncos to start the season. He should hold decent LB3 value for as long as Danny Trevathan is out. SLB Emmanuel Lamur (CIN) - While most of the off-season attention was given to Vincent Rey, it really should have been on Lamur has he secured the other every down linebacker spot next to Vontaze Burfict fairly early in the preseason. He had 11 total tackles in the season opener and with Burfict working through a possible concussion, he's in line to continue that production in Week 2. ILB Larry Foote (ARZ) - Foote is an old and a non-flashy fantasy option, but he gets the job done when given the chance. He led the team in tackles on Monday night with 8 solo tackles, which is a trend I expect to continue throughout the season. SS Donte Whitner (CLE) - I was a bit surprised to see how low Whitner's ADP was this draft season. I suspect his recent stint in San Francisco didn't do much to improve his perceived value. However, he's always been an above average in-the-box safety who should get plenty of tackle opportunities in Cleveland, playing the same role that made T.J. Ward a DB1. If he's still available in your league, go out and grab "Hitner." SS D.J. Swearinger (HOU) - Swearinger is a player I targeted in nearly all my drafts. Houston's defense should be on the field more than they have in the last several seasons and outside of Brian Cushing, Swearinger in the team's main tackle threat. He was relied on to rush the passer on safety blitzes on a few different occasions against Washington and came up with a sack. Solid DB2 with DB1 upside moving forward. CB Leodis McKelvin (BUF) - McKelvin's willingness to tackle has made him a semi-intriguing fantasy prospect in years past, but he's never stayed healthy long enough to string together enough solid games to entice fantasy owners into rostering him. His 13 solo tackles against the Bears were over double that if the next nearest Bills defender. He obviously won't put up those type of numbers every week, but I don't necessarily see his production as a complete fluke. He's worth a roster spot as your CB2 in shallow leagues and possibly a CB1 in deeper leagues pending matchups. S Ryan Mundy (CHI) - Coming into the season, we knew somebody in the Bears safety corps was going to be a viable fantasy starter. Back at the start of training camp, that guy was shaping up to be Brock Vereen; however, he failed to impress enough to garner a starting role. That being said, Ryan Mundy (who's seen fantasy success in small stints when he was with the Giants) is emerging to be the player to own in that secondary outside of Charles Tillman. He led the team in tackles with 6 this past Sunday and with a weak set of linebackers in front of him, it's reasonable to expect that type of production on a week-to-week basis. 75+ solos is within reach.